I’ve been wearing in my Levi’s bespoke jeans gradually over the past few weeks, and the raw denim is settling in well. For those unfamiliar with raw denim, it is favoured by those passionate about indigo twill for the way it moulds to the legs – far more than a regular, washed denim. Obsessives will wear their raw denim for months, even years without washing, to maximise that effect. Odours are dealt with by sponging or even freezing the jeans. I’m some way off that. I tend to wear raw denim for a couple of months – say 30-40 wears – before I wash it. By that point most of the shaping has been done. They should still be put on slightly damp after wash, however, to reinforce some of that wear pattern. The stiff nature of the denim at this stage means that the jeans have sharp pulls and crease marks – as you can see on the examples above and below. Those will soften out with washing. Most important, for me, is the superior fit that the Levi’s bespoke offering has been able to achieve through the waist of the jeans. As regular readers will know, I have a relatively slim waist and (as the tailors put it) prominent seat. This makes it hard to find trousers that fit, and particularly jeans, which usually have a big gap at the back of the waist if they fit elsewhere. That problem has been solved by the cutting of Lizzie at Levi’s, with a section taken out of the yoke of the jeans, pull them tight into the small of my back. Finally, I have jeans that fit. 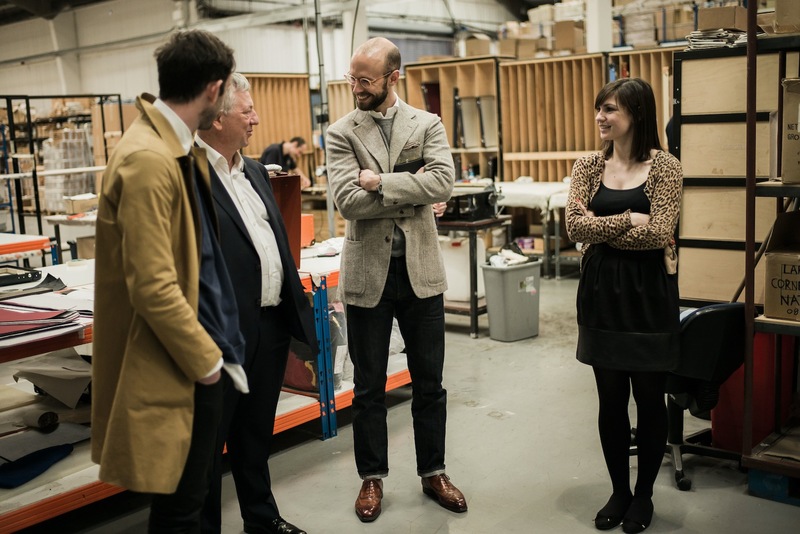 The pictures were taken at the Globe-Trotter factory, which I visited a couple of weeks ago. The outfit is fairly typical of what I wear with jeans: a jacket in a casual cloth and a Neapolitan make, brown or tan shoes, a very subtle handkerchief, and knitwear to help transition a dress shirt. It should be noted that the shirt is also rendered more casual by its soft, Neapolitan collar. Jacket: Elia Caliendo, in Permanent Style Tweed. 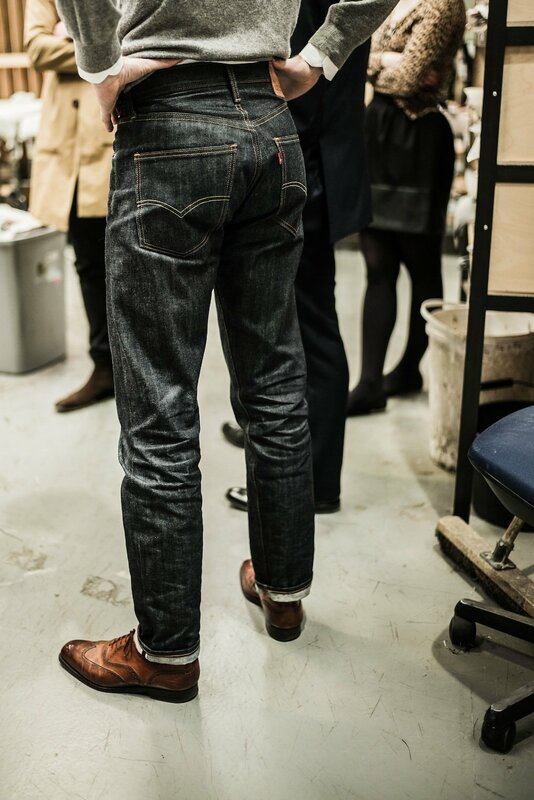 You can follow the discussion on Levi’s final bespoke jeans by entering your email address in the box below. You will then receive an email every time a new comment is added. These will also contain a link to a page where you can stop the alerts, and remove all of your related data from the site. I have always wanted to visit considering it’s 5mins from my house. I had heard they have an “unofficial” factory shop. Is this true? Hi Simon – are those Edward Green’s the Malvern? What last/colour? They look awesome. Firstly, my compliments not only on the jeans but how well you wear them with jacket, shoes etc. I think the photos above are a lesson for all men. Secondly, any chance of a further article on RTW jeans and what you consider is the best on the market? Do you feel they are in anyway superior to “normal” LVC Levis, assuming you can find a pair that fits quite well off the peg? Hello Simon –appreciate your informative posts. Just to let you know that any good alterations seamstress or tailor can do the “gappy back” trick and the jeans look like they came from the factory. Jeans are almost uniforms around here, and I do the “get rid of the gap” alteration 3 or 4 times per month. I have a heavy duty sewing machine and a variety of colors of heavy “jeans” thread. So to your readers who have this problem, I suggest that they ask around, and (most important) ask to see a sample of the person’s work. Thanks again for all the wonderful information; I give your url to customers who want to know more about fine style points. Great fit, Simon. Lizzie wields some sharp shears! Hi Simon, I’m looking for a light bomber style jacket for spring/summer? Any that you partcicularly recommend? Even if it’s not the sort of thing you would probably wear. Would you go for black or navy? I agree re Baracuta. They do a “faded black” colour which might be a good solution to the “navy or black?” dilemma. It is therefore largely down to quality of materials (cotton, hardware) which you can feel for yourself, and the style and fit, which again you can judge pretty easily – and will of course be a personal choice. Nice to break these things down. Great example of how to wear jacket and jeans well – nice work! Given that your jeans are bespoke, I assume it was a deliberate style choice to have the leg cut long enough that the cuffs need to be rolled up. Would love to hear your thoughts on this look. I see it on some people in NYC (usually young hipsters) but I always think it looks like their jeans are too long. Just my opinion anyway! Yes, it was, though not sure I could rationalise it, other than simply liking the look! Hi, Simon. I was interested to hear that you were able to have the cut of your jeans adjusted to account for your “prominent” seat. I have the opposite problem, where my seat is not prominent enough. Can you suggest types of cloth or cuts that will minimise the problem? Unfortunately I don’t think I have much to add – I have overwhelming experience in the opposite direction! 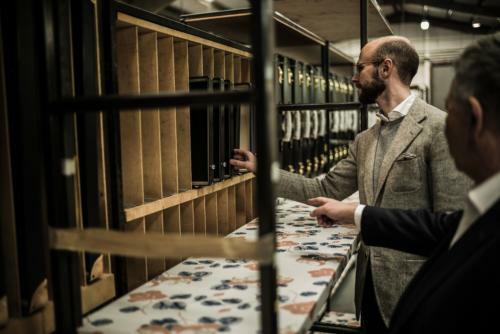 Certainly anything MTM or bespoke will help a lot, and never be afraid to go to a tailor to see what they can do in the way of adjustments. People don’t have things adjusted enough. I’ve been very inspired by your posts about the Levis bespoke service. I am considering giving it a shot. Can you give my any more feedback on your experiences so far with the fit? They look fantastic! Any chance of a few more pics of the final product? Hey – yes they’re doing very well now, wearing in nicely after one wash.
1. As I live in Belgium I was wondering how many times you have to go to the shop to finish the process? After she finished the jeans, do you have to go back for a second fitting and last alterations or is one – initial – visit to the shop enough? 2. How did the jeans fit at first? Very tight? Do they losen up a lot? I have the same problem as you have (small waist, pronounced seat) and almost all RTW-jeans that I buy will be tight at first but too loose after some time, making the back pockets ‘hang’. Hi Arthur – one visit is enough, there is no fitting. The fit is good, but the tightness etc has more to do with using raw denim than anything else. If you’re familiar with how that behaves, you’ll find it works well. Hello Simon, thank you for your kind answer. I happen to be in London for work next week and I made an appointement for my own bespoke jeans 🙂 At this price point it’s something that I can (just) afford and it will be my first expierence with bespoke (although it is not really bespoke I guess?). Because of the durability of denim it looks to me as a real worthwile investment. – Does Elizabeth help you through the process of making the right choices? I have no experience with bespoke (only a little experience with m-t-m suits, and I’m not over enthousiastic about my m-t-m experiences of the past) and I’m not sure what I can expect from her. – Did you choose the mid-rise or high-rise option? I really like the smarter-look you achieved and would like something similar. Great to know. Yes, Lizzie will help you with the choices a lot. As with any MTM or bespoke, though, do think through in advance about everything you like and dislike about jeans and trouser shapes in general. What size of opening at the bottom, for example? And how much do you want to change the details on the Levi’s – colour of stitching etc. Often the hardest thing is trying to make decisions like that on the spot. I went for the high rise, but I’d encourage you to try both and see which fit you prefer. Just want to know how long would it take ? I will visit London soon, but will stay no more than a week. Just wonder if the store will ship the end-product after fitting. Do you have the contact of Lizzie so that I can contact her directly? Thx! It would take a few weeks, and yes they would ship directly to you. I would suggest contacting the Regent Street store, rather than Lizzie directly. They will be better able to answer questions about availability and timings etc. Have you had any issues of them bleeding on to other clothing or footwear or does the roll up stop this ( for footwear anyway) ? Thats good to know. I plan to buy my first pair soon but was worried about my footwear as i often wear light coloured trainers, converse etc. Do you think it’s ok to wear jeans with smart slip ons, something like a C&J Merton ? I recently ordered two pairs of these jeans (mid rise and high rise) from the New York Meatpacking location. Interestingly, they did not offer the Japanese raw denim as an option at the $750 price point; only the Cone Mills denim. Perhaps it was available at the $900 plus price point, but that was beyond what I was willing to spend. Looking forward to see how they turn out. How many levi bespoke jeans do you have completed? In this article, I believe the leg opening is 15cm, while the two jeans in your “How great things age” article have leg openings of 17.5 & 18cm. Is the jeans in this article the same Kaihara jeans mentioned in your most recent article? I have three Bernie – Cone Mills, Kaihara, and a recent cream pair. So the jeans are the same yes. Thanks for confirming and also sharing your thoughts on rise. Excited to finally have jeans that fit with a high rise!